Dennis moved from Albury about 2 years ago and he and his wife Gae have now made their home in Orange. Dennis is a horticulturist by trade (in charge of Randwick Racecourse, Sydney Showground, Dreamworld and many others) and he commenced painting in 1993. The rest they say is history – as he had been winning major awards ever since. • Highly Commended at Bright, Cobram, Culcairn, Corryong, Wangaratta and a Special Guest award at Cootamundra. 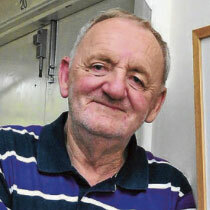 Dennis suffered a stroke some years ago and he was unable to hold a paint brush. While in hospital he was given a set of pastels and he hasn’t looked back since. He now creates the most magical images of colourful and quircky Australians living and working in our towns and bushscapes. He has found inspiration from the great poet Banjo Patterson and these works show a great sense of humour and fun.